Having to retire sadly due to concussion-related injuries in 2011, Dave Scatchard appeared for a number of NHL clubs during his tenure, including Vancouver, Boston, Nashville and New York. 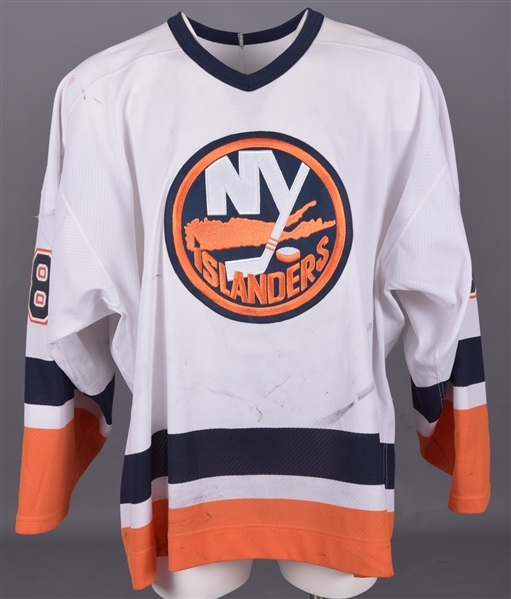 We have an Islanders jersey that was worn by the Hinton native in 2001-02, his third of five seasons on Long Island. 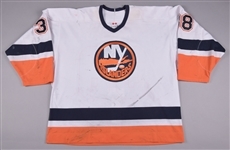 A label graces the collar along with a size “58” fly tag, with KOHO and NHL crests over the back neckline and reverse bottom hem respectively. Styled with the familiar Long Island team crest with embroidered detailing, the white “Set 2” V-neck has been accented with tri-colour tackle twill sleeve and verso numbers, with an alternate patch over the right shoulder. Hammered with use, a number of large stick and puck marks cover the front and sleeves, along with burns and small resulting holes over each elbow. There is also some paint transfer in spots. The team patch sits over the back of the team crest, with an LOA to accompany.